Yes, I’m still here! Lots of stuff going on, work wise and in life, but I haven’t forgotten about this blog. I thought I would pop in to share this piece I wrote a little while ago for a family member’s crafting blog, Susan Being Snippy. She asked for a piece on Pinterest, since many of her readers were interested in it. So I wrote a little article as one of The Social Chicks. If you’ve been hearing about Pinterest and wondered what all the buzz is about, this is a little primer. Although it’s written for crafters, you might be able to see where the benefits to businesses are in terms of links and web traffic, not to mention building a community of loyal followers when you are able to share and promote things your audience is interested in. If you have more questions about Pinterest, feel free to get in touch! Nearly everyone is on social media nowadays, with the most recent estimation being that there are over 483 million daily active users on Facebook, and over 100 million daily users on Twitter. But the latest – and according to many, the most fun social media tool taking the online world by storm right now is Pinterest. 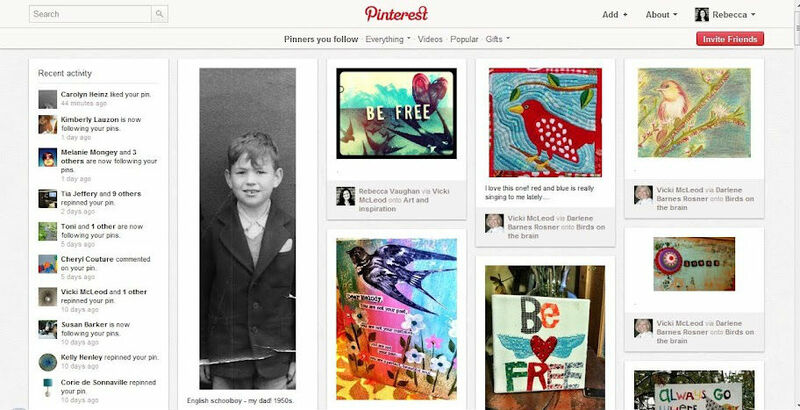 Pinterest is a site that allows users to create “boards” where they can “pin” images to create visual collections to share. You can follow other users and you can follow specific boards they are sharing. 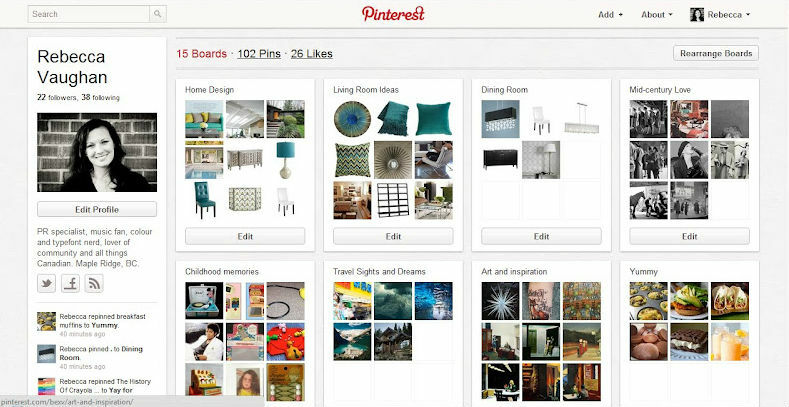 You can also “like” other people’s pins, and even re-pin them to your own boards. So where do these photos and images come from? They’re all linked from commercial websites, blogs, personal web albums, news sites, and all kinds of online sources. If there is an image on the page, it can usually be pinned. Add a “Pin It” button to your browser (it’s super easy to do from the Pinterest site under the “About” menu), and whenever you stumble on to something you love while you’re surfing the Internet, hit the “Pin It” button and you can immediately pin it to your Pinterest boards. So what’s so fun about Pinterest? Find what you love. For crafty types, it’s the opportunity to discover and share beautiful finds. Love knitted crafts? There are thousands of pictures of beautiful and creative projects, all with links to the original site where you can discover how to make it or where you can buy it. Connect with others who love the same. You’re not the only one who loves the gorgeous colours in the quilts and afghans you found on Pinterest. There are others who have liked and re-pinned, and you can comment and follow one another. What better way to find new friends with similar interests? Find out where to get it. Love a product you found on Pinterest? Since the images are linked, you just click on the image and you’ll go straight to the original site where it was posted. You can get all the info you need and possibly even purchase the item there too. Discover how-tos and tutorials. From beautiful knitted projects to creative ideas for organizing your craft materials, Pinterest users are sharing the interesting things they know how to do – and you can save it to your boards to look at later or share with your friends and followers. Create and share collections of your own. You can create boards for whatever you like. If you want to collect photos of ideas for redecorating your living room, you can put all those photos in one place. If you are planning a trip, you can pin photos from travel sites so your whole itinerary is right there on your Pinterest board. And of course if you are planning a new craft project, you can even share step-by-step photos from your blog and bring traffic to your site. There are tons of possibilities for nearly every kind of interest. Currently, to join the site you have to get an invite, so request one from a friend or request one from Pinterest – but be warned, you’ll get in faster if you get an invite from a friend. Pinterest is experiencing so much growth that if you request an invite from them, you might be waiting a while! So go ahead and look around Pinterest and start discovering all the creative, beautiful finds there. But be warned, you might be there for a while! Want to connect with me on Pinterest? Find me at www.pinterest.com/bexv.